Drawing visitors from around the world the Sunken Forest at Sailor’s Haven is one of Fire Island’s most popular attractions. It’s clean, safe beaches are the perfect way for families to spend some quality time with their children and the forest is also an excellent educational experience for children and adults alike. 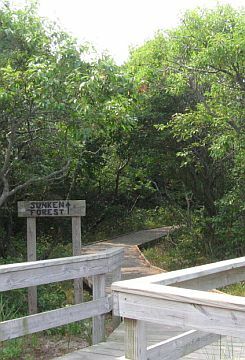 Since it is easy to get to and can been seen in just a few of hours the Sunken Forest can fit easily into your Fire Island day trip itinerary. If you have some time the Sunken Forest can be explored at a more leisurely pace allowing it to reveal it’s many natural wonders. 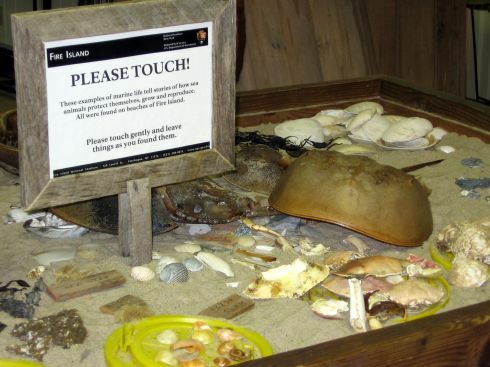 That way you can explore the forest at a relaxed pace, enjoy the nature displays at the visitor’s center, sun yourself at the beach and have a bite to eat at the Sailor’s Haven snack bar. If you get there early you’ll probably have enough time left over to water taxi over to Ocean Beach, another must see town on Fire Island. The beach at Sailor’s Haven is large, lifeguard protected, clean and family oriented. There are public bathrooms and fresh water showers for removing the salt and sand. 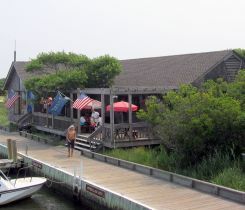 Things like sun block, post cards, souvenirs, insect repellent and even copies of the Fire Island newspapers are available at the Sailor’s Haven gift shop. So what exactly is the Sunken Forest? The Sunken Forest is a unique maritime environment situated in the lee of a sand dune giving it the appearance of being below sea level—hence the name, Sunken Forest. How do I tour the Sunken Forest? Ranger guided tours are scheduled daily or you can hike the trail yourself with a free trail guide available at the visitor’s center. What will I see in the forest? You will see (experience is more like it) a beautiful 250+ year old maritime forest that supports a wide of variety of plant and animal species. 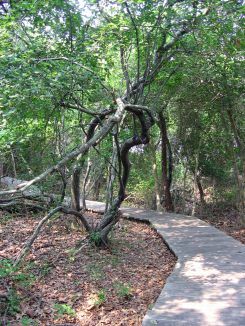 The most common trees in the Sunken Forest are American Holly (These are the oldest trees in the forest and some have been growing since the American Revolution), Sassafras and Shadblow with Black Oak, Sour Gum (Tupelo, Pepperidge), Red/Swamp Maple, Red Cedar, Black Cherry, and Pitch Pine in smaller numbers. In the Sunken Forest’s understory you’ll find Catbrier, Poison Ivy, Virginia Creeper, Inkberry and Blueberry. Yes, you can eat the blueberries. Just make sure that’s what they really are before you put them in your mouth. In the fresh water bogs that dot the Sunken Forest’s floor you’ll see several species of ferns and mosses, cattails and assorted other fresh water plants. You may be wondering how there could be fresh water on such a narrow stretch of land, surrounded by seawater. It’s simple: Think of Fire Island as if it were a big sponge floating on the sea. Rain water soaks the sponge displacing the saltwater. And, since freshwater is lighter than saltwater it tends to float on top of whatever saltwater may be there anyway. The sand dunes that give the Sunken Forest it’s below ground feel are also partly responsible for its shape. 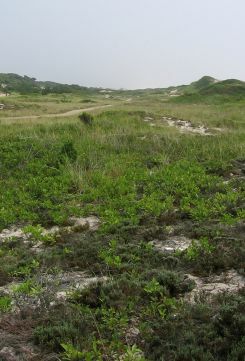 As the trees grow upwards seeking light they eventually attain the same height as the dunes that shelter them and become exposed to salt water spray. The salt spray stops the trees from growing any taller (known as salt spray pruning) and in their effort to seek light the trees grow outwards forming a canopy. The canopy gets thicker as the growing season progresses and near the end of the summer it is truly dark in the Sunken Forest. What else is there to do at Sailor's Haven? The Sunken Forest is Sailor's Haven's main attraction. Other than that you can sun yourself on a pristine beach, eat at the snack bar while reading the latest issue of the Fire Island News or The Fire island Tide (both are available at the gift shop) or take walk over to Cherry Grove 1 mile east. Your best bet approach to seeing the Sunken Forest is to allow yourself a full day. The only way to get to Fire Island is by Ferry or private boat. Here’s how to get to the Sayville ferry terminal for Sailor’s Haven / Sunken Forest, Cherry Grove, Fire Island Pines and Water Island. These directions will take you through the heart of Sayville. The traffic in Sayville can be heavy at times so allow yourself some extra time. Sunrise Highway (Rt. 27) to exit 49, Lakeland Avenue (Rt. 93). Proceed south on Lakeland (turns into Railroad) until you reach Main Street in Sayville--approximately 1.8 miles. Turn left on Main Street then immediately bear right onto South Main Street. Turn right on Foster Avenue. Turn Left on Terry Street. Turn right on River Road. The Sayville Ferry terminal will be on your left. Parking lots are on your right. Look for the signs. From May 28 through September 5 the MTA offers a reasonably priced round trip Beach Package. The package includes the train ride from Penn Station to the Sayville train station, followed by taxi to the Sayville Ferry terminal. If you’re lucky enough to have your own boat you can get to the Sunken Forest and Sailor’s Haven easily. The Sunken Forest is located due south of Sayville between Cherry Grove and Point O'Woods. You can dock at the marina for a small fee or, since slips are hard to get on the weekends, you can anchor out like I do. Keep an eye on water depth because the bottom comes up quickly. I always sail into about 3 feet of water then jump overboard and walk the boat to my favorite spot. Count on using bow and stern anchors to avoid swinging into other boats when the anchorage is crowded.